TL;DR Facebook has released a series of free training resources for marketers. We must say that we are really impressed with their offering. Facebook generally works on education of the market, but this is a really nice course format. 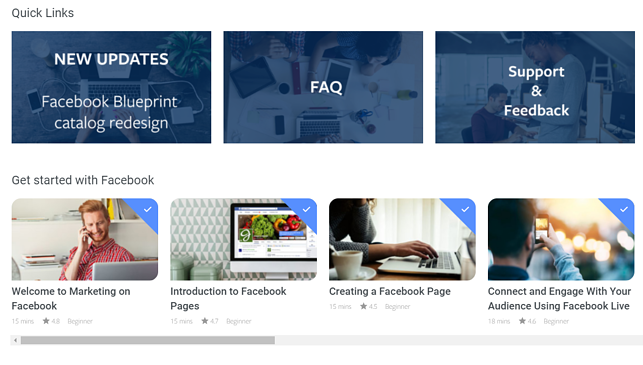 If you’re looking for a free resource for beginner Facebook marketing training, Blueprint is a great place to start. Many of the courses are quite valuable and a great fit for both newbies and skilled marketers. BLUEPRINT – HOW TO START? Just go to the Blueprint page and choose your path. For the beginners it’s recommended to do all courses from the beginning. More advanced users can choose what they are interested in. Facebook offers a series of 34 lessons covering wide ranging marketing topics. There is a brief description and time-estimate (how long it will take to complete the lesson – most often 15 min). Simply click the “Enroll” button to start. We highly recommend to take a look at these courses. You can find there not only basic knowledge about Ads, but also many Success Stories and Case Studies from all over the world. After finishing each course you will get a certificate from Facebook.